Catherine of Weelicious and I go waaaay back. We met 4 years ago. For food bloggers, that’s a long time! I don’t even remember how we met, but I do remember a little rendezvous in NYC in a hotel lobby that involved cocktails. Well, I’m happy to say that Catherine and I haven’t veered too far away from that initial meeting. We are lucky enough to see each other several times a year, always with a little drinky-drink in hand. She’s fun, makes me belly-laugh so loud the walls vibrate and this girl is ah-ma-zing on camera. 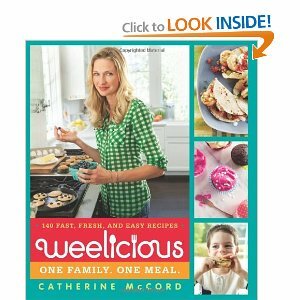 Catherine’s new book, Weelicious, just launched. It’s a must-have for parents asking, “how do I get my kids to like (insert food name)?” The book is all about “One Family. One Meal.” with recipes that appeal to babies, little kids, big kids and parents too. From her gorgeous book, I chose to make “Chicken Teriyak-wee” a.k.a. 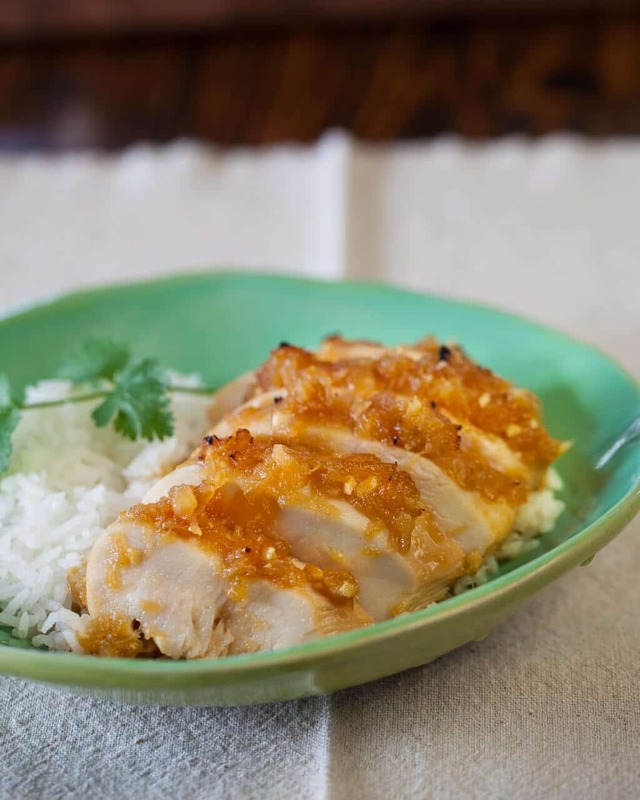 Pineapple Chicken Teriyaki, which is a light, healthier version of the standard Japanese chicken teriyaki. Catherine’s recipe uses either fresh or canned pineapple as the main sweetener in the recipe, and it adds such a bright zing to the dish! 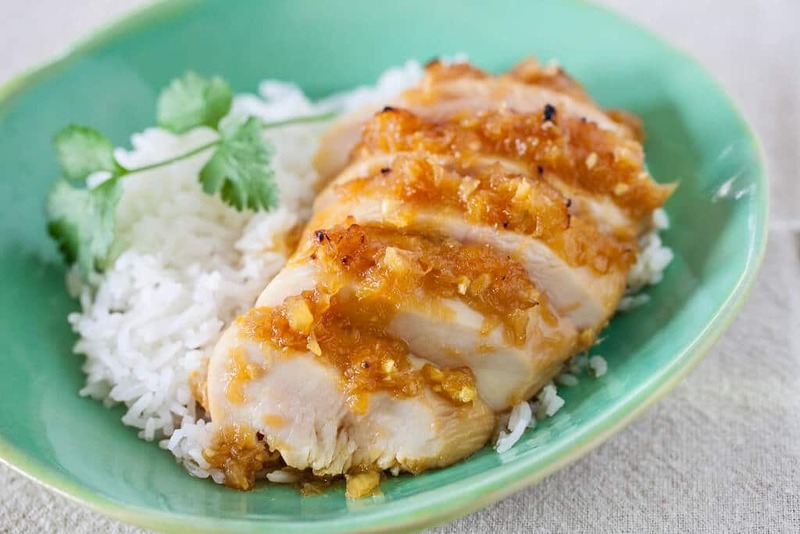 The chicken breast is marinated in crushed pineapple, soy sauce, honey, garlic and ginger. A portion of that sauce is set aside and heated up to pour over the chicken after it’s done cooking. 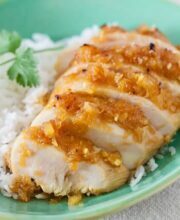 You can cook the chicken breast by grilling or broiling, both methods using little to no cooking oil. So, yay – it’s healthy too. 1. To make the teriyaki sauce, place the crushed pineapple, soy sauce, honey, ginger and garlic a bowl, whisk to combine. Pour half of the teriyaki sauce in a resealable plastic bag and reserve the other half. Place the chicken breasts in the resealable bag, close and give it a good massage to coat with the marinade. Refrigerate for 30 minutes or up to overnight. 2. When ready to cook, turn on the broiler and place the rack in the middle position. 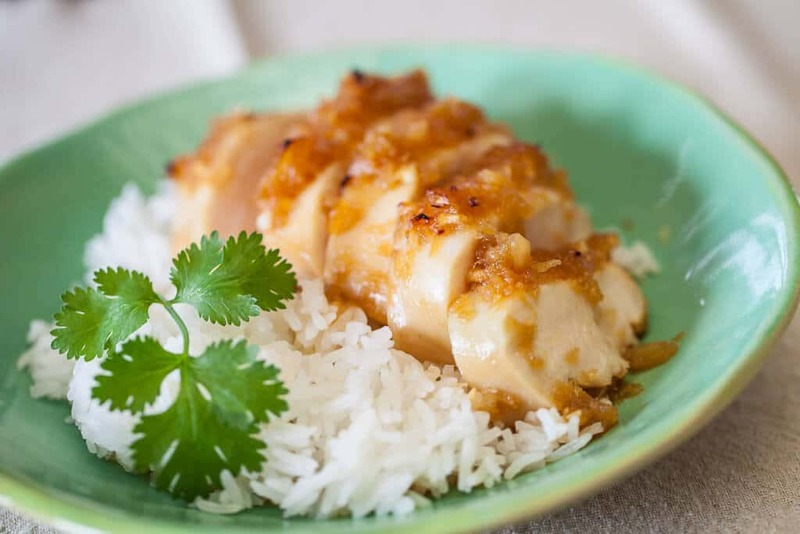 Place the marinated chicken breasts on a foil-lined baking sheet and spoon some of the chunky pineapple/ginger from the marinade on top of the breast. It will help keep the chicken moist. Broil for 8 to 10 minutes on each side, for a total of 16-20 minutes. Discard any remaining marinade in the bag. 3. While the chicken is broiling, heat the reserved teriyaki sauce (that you had previously set aside in step 1) in a saucepan. Bring to a simmer and cook for 3 minutes or until thickened slightly. 4. When chicken is done, Slice the chicken, pour the teriyaki sauce over top and serve immediately. TIP: Keeping the chicken in the marinade overnight will make it even tastier. 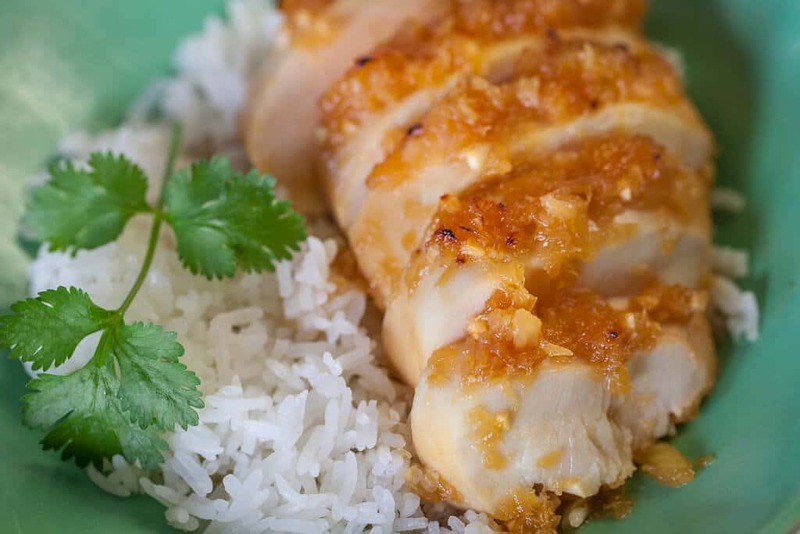 TIP: Instead of broiling, the chicken can also be grilled for 6 minutes on each side.